The hours of operation are perhaps not the sexiest aspect of a library website, but they are nonetheless a “killer app,” providing a small, crucial bit of information for your users. Library hours tend to be quite dynamic, varying from day to day, semester to semester, and year to year. From the user’s perspective, this changeability means it’s the sort of information you will want to quickly look up before lacing your shoes, or planning some last minute research. From the web developer’s point of view, dealing with this changeability just makes your work more difficult. Developing a back end to manage your website hours–or better, to allow someone else to manage the hours–becomes complicated quickly. What follows is an explanation of how to get your library hours running using Google, PHP and MySQL. There is a list of resources at the end, as well as downloadable code for the back-end and front-end pages. 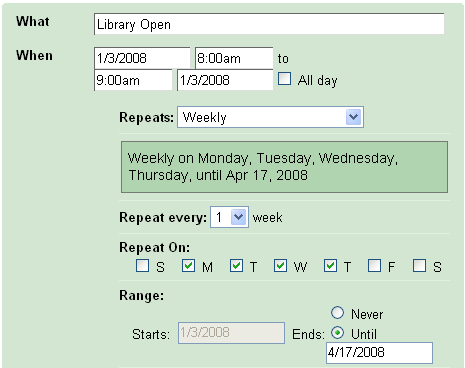 If you choose the “Repeats Weekly” option when adding an event (see Figure 2, below), you get a nice set of tick boxes for each day of the week, and you can set a ending date. I found this the easiest way to handle a repeating event. If the library is closed on a given day, you might add an event with hours like 7:30 – 8:00 am, and then use the word “Closed” in the title. The “hours.php” script searches for the word “Closed” in the title field, and if found, sets a closed flag in the database. The problem is that if you leave a day blank, the feed from Google does not include that date, so you need something in every day. This example does not use the data from the What, Where or Description fields of Google Calendar, but keep in mind that all of these should be accessible through the API if you wanted to use them. You will need to create the table libhours in one of your MySQL databases. The following SQL may be used to generate libhours. While it is possible to interact with the Google API directly, using this library makes everything much simpler. Go to the Client Library download page (Resources, below), download, unzip, and place in your PHP includes folder. Or, put it in any folder and make sure to use the PHP set_include_path to point to this other location. The file config.php (Code, below) contains some configuration variables you will need to set, as well as a basic function to connect to MySQL. Open config.php in a text editor and enter your Gmail credentials (for the Calendar you wish to connect to), your MySQL database name, your MySQL username and password, your hostname (if it’s not localhost), and the path to get to your Zend GData Library (if it’s not in your system-defined PHP includes folder, or you haven’t added an entry to php.ini). You can also set the number of months into the future that the script should check. Calls config.php to get database connection and configuration information. Includes the Zend/loader.php file and loads the Zend classes. Loops month by month, each time adding the information for each day to a SQL query. (I ran into issues sending, say, a six month range, so to be safe it is set to fetch one month at a time.) Inside the loop, the function outputCalendarByDateRange is called. Deletes all entries in the database for the date the script is run on into the future, and then uses the SQL generated in the loop to INSERT the new values into the database. All entries before the day the script is run are retained. setUser will set the user whose calendar you are connecting to. “Default” is only available for “private” feeds, and, as you might expect, will display the default calendar based on the login credentials. setOrderby allows you to either order by “starttime” or “lastmodified.” setStartMin and setStartMax are set in the loop that calls this function. Note that dates are returned as RFC 3339 formatted strings, i.e., 2008-01-26T10:00:00.000-05:00. Visit gdata_connect.php with your browser, and it will run the above script. It should populate your libhours table with the correct data. Note that you seem to need to log out of Gmail/Google Calendar after you make an update (and before this file is run), or else you will not get the most recent changes. With any luck, you now have a working Library Hours application. If you wanted to show a picture of the reference librarian on duty, use the same procedure, but with live queries to Google Calendar. There is a great deal more one can do with the Google Calendar API. You can create, update and delete events in a calendar; find out who is subscribed to a calendar; retrieve “secondary” calendars (which might be useful if you need to manage multiple sets of library hours, although I have not explored this); create entirely new calendars; and so on. There is even the (very simple) option to embed a Google Calendar directly in your page, if you’re willing to hand over the look and feel to Google. The following resources are helpful for getting a handle on using the Google API and PHP. Note that Google is regularly adding features and documentation to their pages, so information and URLs might change. config.php — Set a couple of configuration variables here. gdata_connect.php — The file to connect to a Google Calendar, extract the next X months of data, and insert into a database. hours.php — The file to display the library’s hours in a month-by-month format. Faculty and students often pop by looking for a specific librarian, and I thought these might be useful bits of information. Plus, it’s cool. Live examples of these pages are available: Ithaca College Library Hours and Ithaca College Reference Desk Hours. Each query sent to the Google Calendar API can take a couple of seconds, depending on network connectivity, so some form of caching of results is desirable for a page like the library hours, which is both reasonably static across a semester/term, and relatively high traffic. I like the flexibility of having the information in a database, but you could also print out a set of static pages for upcoming months, cache live queries at an appropriate interval, or just query anew each time a user hits the page. On our Reference Hours page, we do use real-time queries to display a picture of the librarian on the desk at the moment. This is because: a) this is a low-traffic page, b) the lookup is done asynchronously, so there is no delay for the main contents of the page to load, and c) the information changes quite regularly and unpredictably (humans are like that). See http://framework.zend.com/manual/en/zend.gdata.calendar.html #zend.gdata.calendar.connecting for examples of each. There is a singleevents parameter which might make this more readable, however. See http://code.google.com/support/bin/answer.py?answer=55834&topic=10360. A feed’s visibility is set within a specific Google Calendar’s “Calendar Settings” area: Click the Settings link on the upper right of your Google Calendar page, select the Calendar tab, and then click the link with the name of your calendar on it–which will magically create a new “Calendar Details” tab, where you can scroll down and find Public and Private Addresses. This builds upon a script found at http://www.plus2net.com/php_tutorial/php_calendar.php — the first Google hit at the time I was first working on this. The reference librarians at Ithaca College keep a Google Calendar of the reference desk staffing, and make sure to always use the person’s initials in the title field, i.e. “AD on desk.” The Reference Hours page queries the Google Calendar (through an Ajax request, so the rest of the page loads first) for only that hour’s entry, and then matches the initials (AD) to the correct picture, and displays it. Andrew Darby is the Web Services Librarian at Ithaca College in Ithaca, NY. He maintains SubjectsPlus, a free and open-source subject guide management tool. 14 Responses to "Using Google Calendar to Manage Library Website Hours"
I came across this article on IBM DeveloperWorks today, “Integrate your PHP application with Google Calendar”, that nicely extends Andrew’s piece. my task to extract data from MySQL database, which contains events, dates and authors and put the events automatically to Google Calendar. So any help would do. If you can provide me any help, I would be very tahnkful. 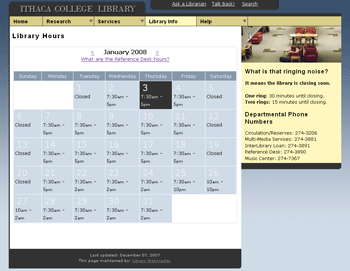 nice article – thanks Darby :) how do you display today’s hours on Ithaca Library’s mainpage? @Darren: We use the method noted above, and a cron job queries the DB every night and saves that day’s hours to a file, which is then read by our home page. Interesting way to do that, Andrew, and less taxing on the server I would think. I implemented this in a barebones form for Haverford’s library website, but didn’t think to do that, so every time the page is loaded it’s querying the db. Plus we just got PHP 5, so I haven’t been able to implement the Google Calendar portion of this yet. I’m going to try that out in January. Oops, I lied! I did come up with something so it doesn’t have to query the db every time the page loads, but not as nice as what you described. Thank you so much for such a well written a useful article. This is pretty useful..I think I might find a couple other uses for this code. I haven’t looked very deep into this, but has anyone had trouble with 24 hour events not showing up in the feed? I tried, and they just won’t import into the local DB. I can’t seem to find the ability to show multiple calendars. Is it possible or I have to separate the queries? Hi All – Just an FYI, Google changed their calendar API in November (see https://developers.google.com/google-apps/calendar/) so the code from this will need some tweaks to get it to work. I’m hoping to have time for this in the new year.